The Ego and the Id. Authorized translation by Joan Riviere. Home » Livres trouvés » The Ego and the Id. Authorized translation by Joan Riviere. A very good tight copy. 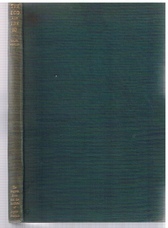 Original green cloth, spine lettered gilt. 88[i]pp.. No dust-wrapper. A little sunning to spine and upper board. ; In 1924 the Hogarth Press became the publisher of the International Psycho-Analytical Library, and as such the Woolfs were the first to publish the complete works of Sigmund Freud in translation. "In early March 1924 the Woolf's moved to 52 Tavistock Square and installed the Hogarth Press in the large basement there. At about this same time James Strachey asked Leonard and Virginia, on behalf of Dr. Ernest Jones, if the Press would publish the International Psycho-Analytical Library, including Freud's Collected Papers" (Orr, Virginia Woolf and Freud). "The Ego and the Id" was first published in 1927 but few copies were printed. This 1935 printing is a second impression. ; The International Psycho-Analytical Library. Edited by Ernest Jones. No 12. Raspail. Scientist and Reformer. With a chapter by Simone Raspail.